iplcancer100316 1...Perak Health Committee chairman Datuk Dr Mah Hang Soon (left) and state health director Datuk Dr Juita Ghazalie (second left) visiting one of the booths at the exhibition area of the state level World Cancer Day celebration held in Teluk Intan on March 10. At first it felt like nothing to really worry about as it was just a small lump in the breast but soon, her world was shattered when the prognosis for cancer read positive. “It was my darkest moment, and I could not comprehend a single word uttered by the doctor as the only thing I thought about at that moment was when was I going to die,” said Sofiah Hussain, a 49-year old housewife. She was diagnosed with Stage Two cancer in 2014 and has her fair share of harrowing tales of pain and excruciating treatments she had to go through during her battle to survive the killer disease. After a very painful mastectomy and six rounds of debilitating chemotherapy, Sofiah was finally given a green health pass last week. “Tests show that the cancer cells are completely gone now but it had not been easy getting to this point,” she said with teary eyes. “Only those who had been through the chemotherapy know the sufferings and the pain one has to endure. 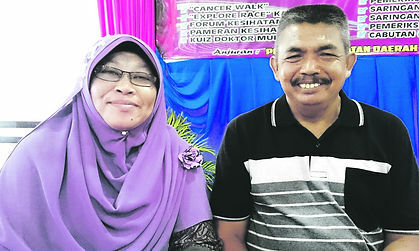 No words can describe it and trust me, the surgery is nothing compared to the chemo,” she told reporters during the state-level World Cancer Day celebration held in Teluk Intan on Thursday. Losing her energy, appetite and weight altogether, her psychological state was slowly slipping away as she was constantly feeling depressed and anxious. At the verge of losing all hopes, she turned to her family which never failed to shower her with constant positivity and love. Sofiah, who was among several speakers who shared their experiences in battling cancer admitted that much of her suffering could have been avoided had she gone for regular checks. She confessed that it never crossed her mind to go for any screenings as she never felt ill or experienced any signs or symptoms of the cell disease. “My mother had colon cancer but never once did I get myself checked,” she said and admitted that it was more to do with modesty that prevented her from finding out earlier.